The Keg Line Cleaning Kit is the key to keeping your faucets, lines, and couplers clean. 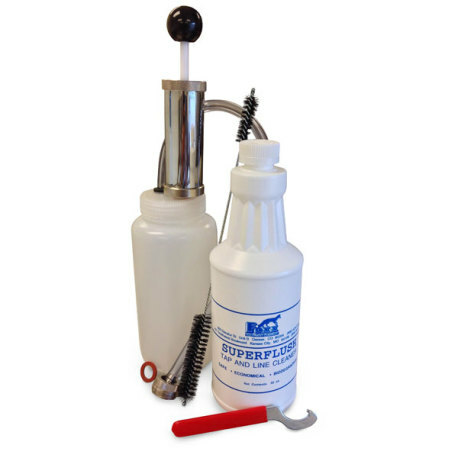 This kit includes a hand pump and cleaning solution container that attaches to your faucet shank, a 32 oz. bottle of Superflush Keg and Line Cleaner, a double ended faucet brush and a spanner wrench for removing faucets and attaching the cleaning pump. Simply mix the Superflush Keg and Line Cleaner at the recommended rate of 2 to 3 oz. per gallon of water and use this solution to soak faucet and coupler parts. Remove the faucet from the shank using the spanner wrench, and attach the cleaning solution container to the shank with the spanner wrench. Pump solution through the liquid line and out into a bucket, then allow solution to sit in the lines for a few minutes. Fill the cleaning solution container with water and pump through to flush lines. Use the double ended brush to clean faucet and coupler, then flush with water and reassemble. Repeat when changing kegs to keep beer flowing free of foaming issues, beer stone buildup and bacterial infection.